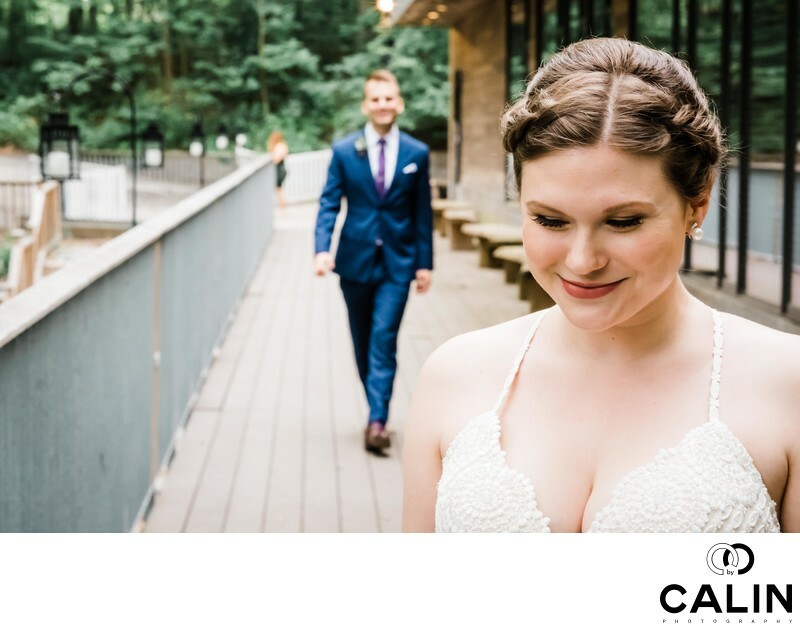 This picture taken during the bride and groom's first look at Kortright Centre features an excited groom sprinting towards his beautiful bride. He is about 10 feet behind her and we can see the happiness on his face. What makes this picture different is a technique known in photography as layering. The bride in the foreground is looking downwards and her face denotes shyness. The fact that her eyes do not engage the viewer forces the latter to look elsewhere for another subject in the frame. In the background we see the happy groom advancing towards us in the juxtaposition of the two stories makes for a very powerful wedding photo. Nowadays, everybody's a photographer. After all, we all carry around a pocket camera embedded in our phones . To be a professional photographer, you only need a camera and the flash and you are in business. At least this is what the new wedding photographers in Toronto believe. I would beg to disagree! Jumping headfirst in this competitive industry is a recipe for disaster. I was reading a book by Angela Duckworth - The Grit when it struck me. Maybe the most important quality of the best wedding photographers is grit, resilience, the ability to jump back on the horse off to you fall, with the same enthusiasm no matter how hard it is. While that is a necessary condition for success, in the GTA it takes one more thing grit to succeed. To be able to differentiate oneself from the peers, one has to excel in everything from customer service, photography technique, post processing and business acumen. You would be shocked to learn that most professional photographers spend more time doing administrative tasks to grow their business then actually shooting weddings. On the wedding day, the technique should come naturally through experience and repetition because there is no room for improvisation. Not unlike an athlete who practices incessantly before a competition, the photographer does the same in order to shine on the big day. I have been often complimented by brides and grooms who believe that my skill comes naturally as a result of my talent. The truth is that talent is not something I possess. My talent is the result of thousands of hours of purposeful practice. My inspiration on the wedding day comes from scouting the venue and drafting an action plan at home. On the special day, under high pressure pressure I strive to execute flawlessly my plan. For each couple I create a storyboard or if you want a shot list customized for their own personality and preferences. In order for the artist to create under pressure, he needs to know the equipment by heart. The camera he comes in extension of the photographer, a tool used to achieve his vision and create splendid wedding photographs. This Kortright Centre for Conservation gallery is the pinnacle of five years of hard work on the craft. Kortright Centre for conservation is one of the most popular venues in the Greater Toronto Area. It operates as a nonprofit organization under TRCA along with Black Creek Pioneer Village. Location: 9550 Pine Valley Dr, Woodbridge, ON L4L 1A6.